We arrived early at TTP car park and filled out our paper work. Mistake number 1 – if you get there early you are conscripted to write about the trip and of course you can’t say no, you want to impress. It started to rain while we were given instructions and forming the groups, but it soon stopped. The turnout was good, so two groups were formed: we found ourselves in group 2 behind Julie the navigator for the lead vehicle, mistake number 2. 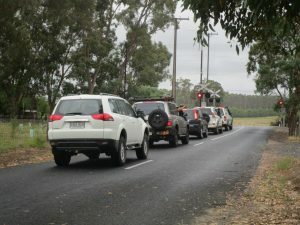 After a bit of a delay we finally left the car park and headed towards Meadows, missing the right turn to Lobethal – GPS error we were told, mistake number 3. We were concerned that we had not heard any communications on the radio, so checked with Julie, who said that there had been a lot of chatter but we weren’t receiving it. Our new radio was on the blink Alan thought. Onward through Lobethal and following our leader, we missed yet another turn. Turns out the GPS had so many way points it was hard to see the route we had to take, we were told by Trevor, mistake number 4. This is fun? Yes! To the rescue came Bill, new to the club as well, but being a Hills dweller, he had a good knowledge of the area, and was confident he could get us out! He took over as leader from Lenswood, and also supplied us with a radio that could actually send and receive. We turned around and headed again towards Meadows. Unfortunately, we THEN had to deal with a goods train lurking in a siding – but still tripping the signals – thus stopping the convoy again! Onward to Meadows for morning tea which we all needed at this point. Julie and Trevor’s GPS was sorted out by expanding the view ready for the continuation of the trip. However, my radio was still uncooperative, and even with the vast knowledge of the club members, they could not get it to work. From Meadows to Goolwa the lead went back to Julie and Trevor and was uneventful. 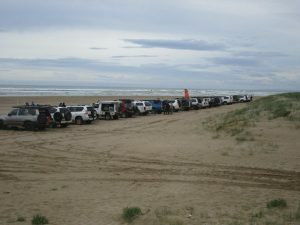 We all arrived at the car park to let the tyres down (20 psi in our case) for the trek across the sand and lunch. 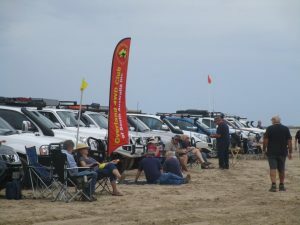 During this time on the sand Bill found the “Advanced” manual for my radio and we determined the problem was to do with a ‘team squelch’ setting being ‘on’ which only allowed signals from the Team if we were all using the same squelch code – my mistake. Switching this off made it function normally again, but was of course not required for the return journey. This was the first time we had used 4WD on this vehicle Nissan X Trail, and it seemed to go through the sand with no problems. It turned itself off 4WD most of the time as it was not needed. It engaged only on the really soft sand, so I guess any 2WD car could have got most of the way. After lunch, strolls and gossip, it was back in the car park to reinflate the tyres which took about 5 minutes with the pump, and to say our goodbyes. We headed off to our friends on Hindmarsh Island. A great day was had by all, and we are looking forward to the trip to Peake in April and a bit of training from Mark. As new people to the club, we found everyone welcoming and willing to help out ‘newbies’. Also we should have been accepted as members by then as long as no members object to us joining that is.